OK, now that Hornblower Niagara is running evening cruises, here's a little free advice on how to pick the tour that’s right for you. Guys, if you're looking to score some points with that special someone, the Sunset Cocktail Tour is so romantic she'll forget you left your socks on the floor all week. Moms and dads, if you're looking for some family fun, the Fireworks and Illumination Tour offers so much excitement and fresh air, the kids will hit the hay with memories of seeing a world-famous landmark from a totally unique perspective. Night-time tours were among the new services Hornblower Niagara promised to add when it won the contract with the Niagara Parks Commission to provide boat tours from the Canadian side of the Niagara River. A month after launching its 2014 season, the first evening cruise sets sail Sunday, June 1. This is Hornblower's first season in Niagara, but the company runs boat tours in New York City and San Francisco. The Niagara gorge takes on a very different feeling when night falls. Somehow the thundering waters seem more serene after dark. As passengers board for the 8 p.m. excursion, the sun is setting, twilight's falling over the Niagara gorge, and the busy day is drawing to a close. There's a chill in the air that makes her lean in a little closer. If you're smooth, you'll offer her your jacket. Savouring a glass of wine while mulling over all you've seen and done is a relaxing way to wind down your day in the falls. On the first hot Sunday of June, Heather Schaloux was wearing a summery purple dress when she boarded the Niagara Thunder, one of two catamaran vessels Hornblower Niagara launched this year to take over the boat tour business. At the end of the one-hour tour – not a wrinkle in her dress, not a hair out of place. 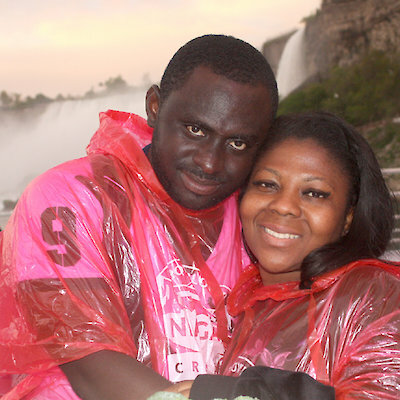 They were just a few of the couples spotted getting cozy as the Niagara Thunder tour boat plied the lower Niagara River in darkness. Hornblower allots an hour for the evening tours – 15 minutes to board, 30 minutes on the water and 15 minutes to disembark. The boats make a couple loops of the lower river between the Horseshoe Falls and Rainbow Bridge. The ride also offers unrivalled views of the Fallsview tourist area’s bright lights, the rugged terrain of the Niagara gorge and the American Falls. The sunset cruises don’t go as close to the mist as the daytime tours do. And the lower deck of the boat has retractable glass windows that keep the mist out at night, but during the day let passengers fell the mist on their faces like they have for years. 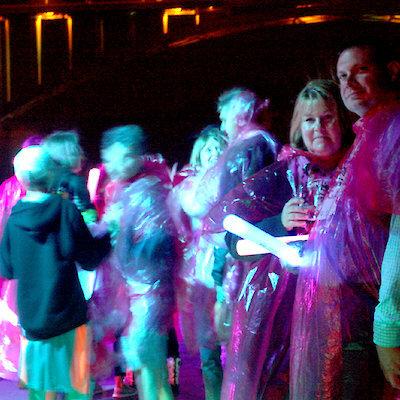 It all means, night-time passengers stay dry and it’s poncho-optional. A couple could even arrive dressed for a night on the town, go for a cruise then take in a late dinner or try their luck at the casino. As romantic as the Sunset Cocktail Cruise is, it’s more of a party atmosphere for the Fireworks and Illumination cruise at 9:30 p.m. You don’t have to be a kid to get caught up in the excitement of a boat ride, glow sticks and fireworks. You think you’ve heard fireworks rumble before? Try being in the middle of the Niagara River as the blasts echo through throughout the gorge. Hornblower bills it as “fireworks cruise” on Wednesdays, Fridays, Sundays and holiday weekends – whenever the Niagara Parks Commission sets off its 10 p.m. pyrotechnics, said Hornblower marketing director Lee Carr. On nights when there aren’t any fireworks, it’s billed as an “illumination tour,” cruising past the American and Horseshoe Falls, lit up by spotlights on the Canadian shore. “We’ve really expanded the operating day and, in fact, we’ve expanded the operating season,” said Carr, a veteran of the tourism industry, who spent years in marketing at the Skylon Tower before jumping aboard the new boat tour company. Already, that’s happening. Kofi and Christa Opoku, from Columbus, Ohio, planned their weekend around the sunset tour and stayed an extra day to be on the maiden voyage. But the bar is open, serving wine and beer and hors d'oeuvres. Passengers bask in the glow of rainbow-coloured flood lights and the sounds of mellow jazz music plays over a sound system. “You can’t have a better vantage point for fireworks. To see the falls this close is pretty spectacular,” said Jonna Anne, a visitor from Rochester, N.Y. She and her husband Mike knew they wanted to take a boat tour and they wanted to see the fireworks. "We were going to do the cruise anyways. I thought it would be a good two-for-one. It turned out to be the perfect two-for-one,” Mike said.